I just finished a 75-day cycling holiday in Scandinavia… and of those 75 days in northern Europe, I spent a full 52 days in Norway. I had heard that the Scandinavia countries of Sweden and Denmark were expensive, but I had also been told that Norway was by far the most expensive place to live, world and travel in all of Scandinavia. Because I was planning to be in Norway for so long, I was a little fearful about traveling there – I was afraid of how much my trip might cost me. But now that I’ve spent almost two whole months traveling in the country, I can tell you that Norway isn’t nearly as expensive as everyone makes it out to be. In fact, I was able to travel through Norway (and Scandinavia as a whole) for less than $20 USD per day! In the end, my travel expenses in Norway cost me just 6,723 NOK… or about $799 US Dollars. Divide that by the 52 days I spent in the country and I was spending only $15.36 USD per day. That’s even less than the total amount per day I spent in Scandinavia (which was closer to $19 USD per day). Now that you know how little it cost me to travel in Norway, you’re probably wondering how I did it. To explain, let’s quickly break down the travel expenses listed above. Food was by far my biggest expense in Norway. On many days, food was actually my only expense. Because I was mainly traveling on my own and doing my best to keep my travel expenses as low as possible, I shopped mostly at the local supermarkets (Rema 1000, Rimi and Kiwi) and rarely ate at sit-down restaurants. When I shopped for myself, my average cost of food for the day was between $7 and $15 USD. But when I ate at local restaurants, I’d usually end up paying in excess of $25 USD for a single meal. So, there’s my first big tip for saving money in Norway: shop at the discount supermarket and prepare your own meals whenever possible. As soon as I hit the west coast of Norway, I began jumping on a regular succession of ferry boats. Getting around by ferry is not only convenient in Norway, it’s sometimes the only way to get from one destination to the next. Luckily, the ferry boats in Norway were not nearly as expensive as I thought they might be. Because I was traveling either on foot or by bicycle, I was able to avoid the larger ferry fees you might encounter when traveling with a car and was able to pay far less for my ferry tickets. During my time in Norway I paid for 9 different ferry crossings, which cost me 154, 20, 68, 48, 109, 650, 29, 44 and 34 NOK each. The lower-cost ferries were usually short rides lasting no more than 30 minutes and they cost $2.50 – $8.00 USD each. The longer ferry rides (30-90 minutes) cost a bit more – somewhere between $13.00 – $77.00 USD for each ferry ride. The cheapest ferries in Norway are the ones that allow you to cross with cars. The more crowded the ferry boat is, the cheaper the tickets usually are. The most expensive ferries are the smaller, express-boat ferries, which transport only pedestrians and people on bicycles. If you’re trying to save money, take the larger car ferries and avoid the small express-boats! While traveling in Norway, I traveled by train on four separate occasions. My round-trip train ticket between Oslo and Bergen was by far the most expensive train ticket I purchased (at $75 USD for the round-trip ticket), but I had to pay an extra 388 NOK ($46 USD) to take my bicycle on the train with me. I took two other short train rides in Norway while I was there – each one costing me no more than $30 USD. Buy your tickets in advance if you can. The trains accept credit cards on board, but you should be carrying some cash with you, just in case! Getting around by bus is by far the cheapest option (next to traveling around on foot or by bicycle). Bus tickets in Norway cost me 165, 50 and 165 NOK each. The cheapest ticket was about $6 USD… and the most expensive (a 2-hour bus ride from Bergen to Matre and back) was $20 USD per direction. If I were to go back to Norway again (as a backpacker or anyone hoping to get around for cheap), I’d certainly look into doing more of my travels on the bus. There are buses running in big and small cities/towns all over Norway. The bus system is incredibly well organized and it’s far more affordable than I had initially imagined. No matter where you travel in the world, there are always a few unexpected expenses that tend to pop up. For me, my extraneous expenses in Norway included a trip to a local museum, the cost of some new toiletries, and a few other related travel expenses. In the end, these extra travel expenses only added a few extra NOK/Dollars to the total cost of my travels in Norway. 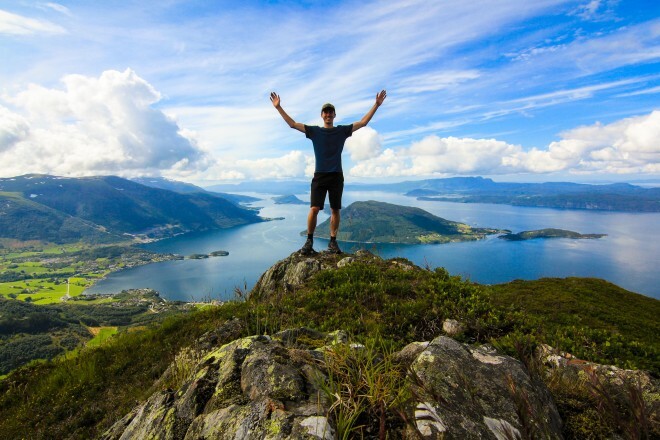 Do you want to know the real secret to traveling in Norway for such a small amount of money? The way I was able to travel for 52 days in Norway and spend only $15 USD per day is by traveling on a bicycle. Instead of getting around every day on a bus, train, boat or car, I ride my bicycle from one location to the next. Instead of paying to sleep in a hotel or hostel each night, I sleep for free in the forest on public land (something that is both legal and encouraged in Scandinavian Norway). And instead of eating out at restaurants every day, I shop at local discount supermarkets and prepare my own meals. When you ride a bike across the country, sleep for free in the forests and eat only the cheapest of foods, then it’s totally possible to travel across an expensive country like Norway for as little as $15 to $20 USD per day. But the truth is, many people don’t want to travel in this way. Most people think of travel as an easy, relaxing vacation from their ordinary lives. This involves taking trains, buses, boats and cars – all of which costs money. This involves eating out at fancy restaurants three times a day – all of which costs money. And this usually involves staying in a comfortable hotel each night, sleeping in a warm bed, and having access to all the comforts of home – all of which costs money. 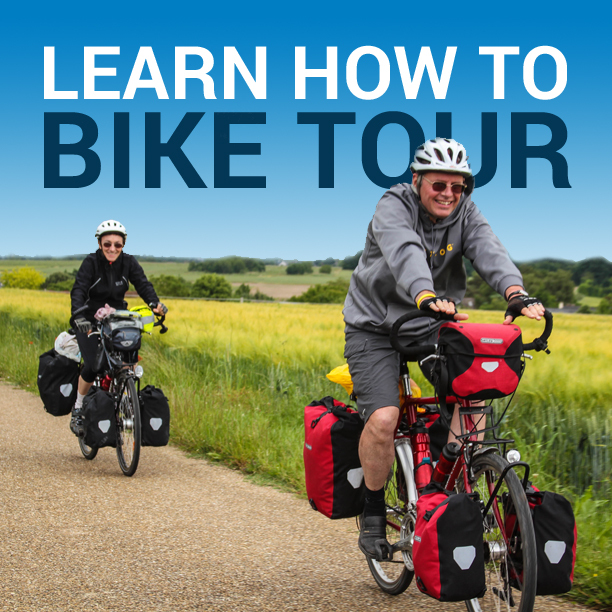 If you’re interested in traveling by bike, and don’t mind spending a little bit to have access to the comforts of home (delicious meals, daily hot showers, and a warm bed to sleep in each night), consider signing up for one of these three self-guided bike tours. Self-supported bicycle touring is an incredible way to travel and see the world. It’s both rewarding and inexpensive. But the truth is, bicycle travel is cheap. Once you learn how to stay safe and comfortable on your bicycle and sleep in a tent each night, you can travel the world with very little money and live an amazing life, having an incredibly holiday, and even travel through some of the most expensive places on the planet without spending very much money at all. Yes, traveling in Norway is a bit more expensive than traveling in some of the world’s other developed nations. Hotels, food, and transportation can be expensive. But if you’re on a budget, you want to see Norway in a way that is both intimate and rewarding, and you want to spend as little much as possible, then consider seeing the country on the back of your bike. CLICK HERE TO LEARN HOW. Travel in Norway is cheap when you learn to travel on a bicycle! This entry was posted in Bicycle Touring Pro Articles, Europe, Locations, Norway and tagged cost of food in norway, costs in norway, europe trip cost, norway bicycle tour, norway bike tour, norway camping, norway travel guide, norway travel tips, norway trip cost, travel in norway, trip to norway cost, visiting norway. Thanks Darren, very helpful article! Please could you write to me and tell me your thoughts on pros and cons about the rohloff speed gears? Better than regular chains? Why dont you have them in your bike? Essy to find supplies when travelling on regular chains? If you had read The Essential Guide To Touring Bicycles you would know that one of the main characteristics to look for in a touring bicycle (especially a bike that is planning to go to remote corners of the globe) is very basic parts. You want a bike that can be easily repaired anywhere in the world. And that means using a traditional chain, gears, etc. Many modern touring bikes are now equipped with Rohloff gears, etc… and I do see those becoming more popular in the future. But for me personally, I chose not to have that type of gearing on my bike because I wanted a bicycle that could be repaired anywhere in the world (South America, Africa, etc). I would like to try using Rohloff gears in the future, but I’ve not done it yet on any lengthy bicycle touring adventure. The true cost saver in Norway is trash-diving. Scandinavians throw away perfectly good food.